Wooden Yardsticks are also an appreciated free gift to take home during grand opening weekends or special events. As they are long lasting, they provide an excellent promotional and advertising value. Cheap advertising on image of natural finish yardsticks. Same imprint and scale is printed on both sides of the stick in one color ink. Pricing includes imprint of up to 110 characters and spaces. English scale. 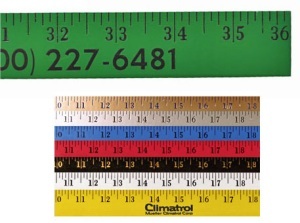 Standard yardstick length is 5/32"x1-1/8"x36". Maximum logo height is 1/2". Bright advertising on vibrant neon colored yard sticks. Same imprint and scale is printed on both sides of the stick in one color ink. Pricing includes imprint of up to 110 characters and spaces. English scale. Yardsticks book colors are available in neon yellow, neon orange, neon pink or assorted (with black imprint). 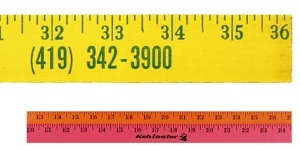 Yard stick is 5/32"x1-1/8"x36". Maximum logo height is 1/2". For all yardsticks, pricing includes straight-line ad copy printed in one color on both sides (same imprint). An additional $55 non-refundable artwork/proof charge per color must be paid before work can begin. Since a paper product proof is provided on our wooden yardsticks, any changes requested after first proof will require additional $50 proof charge. For logo or special type style, add $30 per color for every 3" in length. Contact us for multi-color imprint.